L: You're 3.5 years old and you still ride this little bike with amazing skill. How you don't scrape your feet and still zip around on it is a bit of a mystery! H: Your first class"performance". You'd been sharing your "secret" song with us for weeks and the excitement was huge! And a zebra on a zebra crossing for your group t-shirt design... could it get much better? A: After so much practice, you were the sweetest wee thing up there with your class performance. The week ended a bit rough with you dragging yourself off to bed and sleeping in the middle of the day... something you haven't done since you were 9 months old! And then I had to include this photo of you 3 doing the haka... you 3 crack us up with the different moves and interpretations! After the first flowery hottie cover a few months ago, I received a request for another... in yellow and blue! Two of my favourite colours! In addition to all the pretty blue flowers, I added the wee white blossoms for a little extra dimension. I was thrilled with how it turned out. So what have you clever creatives been up to? Looking forward to seeing what you share. H: Such sheer delight in jumping in puddles. A moment of sunshine after all that rain and then the bonus of splashing to your heart's content. Asking you about your day at school is always interesting... we get a blow by blow of the whole day with so many details. A huge contrast to big sis who occasionally, and still, only gives us a headline or two. And you always fill the house with your singing... all the time, usually stuck on repeat but ooh so delightful. Love this song - awesome encouraging lyrics. They were easy to whip up and fun to make - even an inexperienced clothes sewer like me didn't struggle with it. Confident beginner is the skill level I would assign to this item. The wee pockets were essential as we never seem to have enough vessels for all the treasures that are collected... I can confirm that they can hold quite a few seashells! Of course, you can sew them without the pockets if you chose to. Our pair are from denim for year round versatility and they look adorable with or without tights! Of course you could make them in heavier fabric for winter or something light-weight for summer. Oh so many options and possibilities! Now for some happy news. Lisa is offering 15% of the Pixie Pants Pattern and the Pixie Shorts Pattern for the duration of the blog hop. All you need is the coupon code PIXIEPANTS15 (valid until Tuesday 23 September). 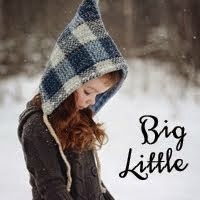 Be sure to check back in on the Big Little blog on Tuesday for a giveaway too. Tuesday 23rd - Viki - posted by Big Little and a GIVEAWAY! Of course don't forget to link up your creations from the week! Cant wait to see what you've been up to! A trip to the beach was just the ticket for us girls this week. A break from the usual post school routine, we headed to the beach for a change of scenery, fresh air and some fun. Amazing what a difference it made, and how refreshed we all were for it. A: What a week we've had. On Monday night you lost your second tooth... unfortunately the tooth fairy was a bit preoccupied and forgot to visit during the night. Cue a very sad you on Tuesday morning... However, on Wednesday morning you awoke to a coin and a teeny card written by your fairy in her teeny writing explaining that she had an influx of teeth and had to attend a very special mouse birthday but had not for one minute forgotten you. You were so chuffed to have received this personal note and the tooth fairy's halo was restored. L: Wheeeeeeeee! Your grammar and language is evolving rapidly, though I still delight in words like "bumrella" instead of umbrella. I've also enjoyed watching you play with little friends lately in a much more mature fashion - playing together, interacting and compromising at the next level - well beyond the toddler "individualistic together" play. I've been asked a few times, and again this week, you must be starting school soon? Not for anther 18 months if I can help it! A couple of months ago I received Patchwork Please, as hoped, for my birthday. I was super excited and loved all the gorgeous ideas and patterns in it, especially as I'd heard and read many great things about it! I almost immediately set about making this pencil case as a "returning to uni" gift. However, perhaps I need to go back to uni, because I did not find the instructions smooth sailing...and I have sewn one or two things in recent years. Is it just me? I got there in the end, and am delighted with the final result. It's a wee bit small though, but you can probably manage to fit a few highlighters or maybe other random stuff in there. I love the pencils and thought them very appropriate...though they will need a few sharpenings before they'll fit in! What's your experience with this gorgeous book? Or do you have recommendations on treasure-trove-must-own-project-books or any not-on-your-lemon-do-you-want-to-go-there books? Hope you're all having a happy sunshiny week! H: You are such a great bike rider - and I love watching the concentration on your face as you work at staying upright. This morning, very unexpectedly, I had to say goodbye to my Josie. My heart is so utterly crushed and all I could think to do was to write about her. 14 years ago we adopted this little moggie. She'd been abandoned, and friends of friends had heard we were looking for a cat. A vet confirmed that she was a year old and likely to have had less then gentle treatment. Taking her home from Mission Bay where she'd been found, to Northcote, we decided to call her Josie. Mostly because we'd just watched the terrible "Josie and the Pussycats" movie a few days prior and thought it hilarious. She was our first baby. It took months to gain her trust and venture out from under the bed or let us near her. We got there eventually and soon she was sleeping on our bed and snoozing on our laps. She never quite warmed to anyone else and always disappeared at the sight or sounds of another human. 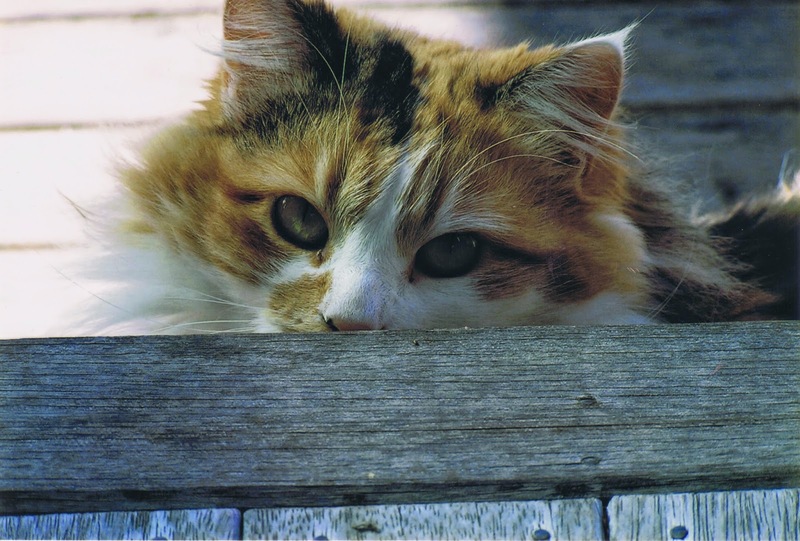 People referred to her as our phantom or imaginary cat, as sightings were so rare. I am allergic to cats but built up an immunity toward her... I was utterly in love with her and determined to be buddies. 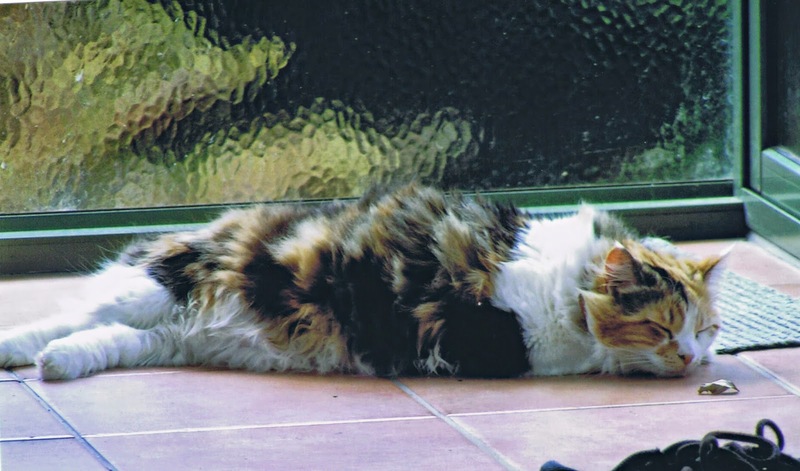 She moved all over Auckland with us and never once seemed even close to running away. She brought us two mice and one bird in all her years and didn't really scrap with other cats. The biggest thing we did that bothered her was having human babies. She has up until last night, made a habit of disappearing outside before the kids woke up and would come back in when they were asleep. Then she would hang out with us, sleep at our feet and occasionally grace visitors with her presence...provided they weren't children. Over the last couple of days we noticed she wasn't cleaning herself properly, she was dropping her cat biscuits and had her tongue poking out just a wee bit. Not finding anything immediately wrong and not in any obvious pain we figured she was just getting a bit old. But then a couple of nights ago, we felt a strange and rather huge bulge all down her jaw, which was very well disguised. Her eating was obviously a real mission as she was barely getting anything down...we'll take her to the vet next week we decided. And then last night she came in, all bloodied. Something was now obviously not right. So we cleaned her up and cuddled - a bit concerned but not expecting the worst. This morning I took her to the Vet who said it was a tumor on her jaw. It had obviously been growing rapidly in the last couple of weeks and was making eating, swallowing and closing her mouth hard... and also pushing her teeth out and rupturing her gums. She was not in terrible pain though a bit uncomfortable, but otherwise in great shape for a 15 year old lady. However, there was nothing we could do and it was only a matter of days before things would go downhill even more quickly. I cuddled my baby as they put her to sleep. I am grateful that she is at peace and wont suffer. I am grateful I got to say goodbye, hold and cuddle her as she went to Heaven. 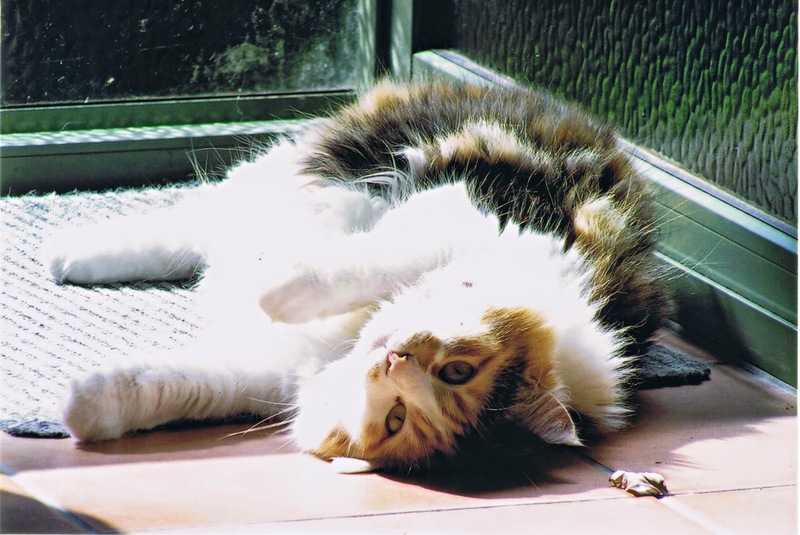 My heart is heavy - I will miss her coming in the bathroom window while I brush my teeth, purring and slobbering as I pat her, her weight beside me while I'm sleeping or her face staring at me in the middle of the night, her gorgeous soft fur and her super soft belly. That she trusted me, and I loved her. Haven't listened to this in a while, but it's one of my fav songs. When in search of snow, one should go prepared... And we were not! The girls lacked some warm beanies to cover those delicate little heads and ears, so what's a mother to do but remedy it?! A bit of guessing, a bit of measuring on the models and we came up with placement and a plan. Added some braided tassles and they were happy as larry, and good to go! What have you been up to? My thoughts are turning to Christmas already... you? At the beginning of the hear Lisa rallied around for a few people to join a Fat Quarter Birthday Swap. The idea is that you send each person a fat quarter on their birthday, and of course for your birthday you get a fat quarter of fabric from all the other swappees! Sounds a bit irresistible doesn't it? Anyhoos, birthdays came and went and lots of happy parcels have been sent off. In July some happy parcels started arriving in my letterbox! Look at all those delights and treasures! Goodies are from Leonie, Ange, Cat, Juliet, Lisa, Treena and Angie.